The winter chill is just about to hit, so now is the time to start looking at a fireplace so that you can have it installed and up and running before you need it most. Whether you’re looking for a wood or gas fireplace, there are a range of options to choose from to suit almost any installation. Nothing beats the warmth and romance of a fireplace. When it comes to gas, there is a wide variety of styles and designs to choose from. The first decision in choosing a gas fireplace is deciding between an open or closed style. The key difference between open and closed gas units is that open gas fireplaces are considered more decorative as they only emit moderate radiant heat, and require ventilation in the room. You can customise the look using different media, fronts, fascias and mantels. Whether you’re after contemporary styling, or a more traditional look, it’s easy to customise a design to your decor. Closed gas, or balanced flue gas fireplaces, are an efficient and clean burning option for your home. Balanced flue systems use a twin skin flue, meaning that clean air is drawn from outside, and any by-products from the unit are expelled externally, ensuring that optimum indoor air quality is maintained. With a range of sizes and heating capacities, an appropriate fit can be found for your needs. There are two key distinctions when it comes to wood units – open wood or slow combustion. There is nothing quite like the flickering flames of a real wood fire, and with a slow combustion fireplace, you also have an option that is efficient and will keep your home warm. If you are looking for an open wood fireplace, there is a large range of styles and sizes top suit your home, including freestanding and double sided varieties. Generally speaking if you already have an existing fireplace, it is simply a matter of inserting the appropriate size box into the brick fireplace and using the existing chimney. Slow combustion units offer powerful performance as both freestanding and insert models. With long burn times and high heat output, they can sometimes be used as a primary heat source, handy if gas if unavailable or impractical for your home. Efficiency is also something to keep in mind when looking for a slow combustion fireplace, as 10% efficiency is equal to 1 tonne of firewood burnt per year. Definitely means less trips to the wood pile! With so many different options to choose from, selecting a fireplace can become a little overwhelming. Always be sure to talk to an expert to ensure you the get the right information for your home. 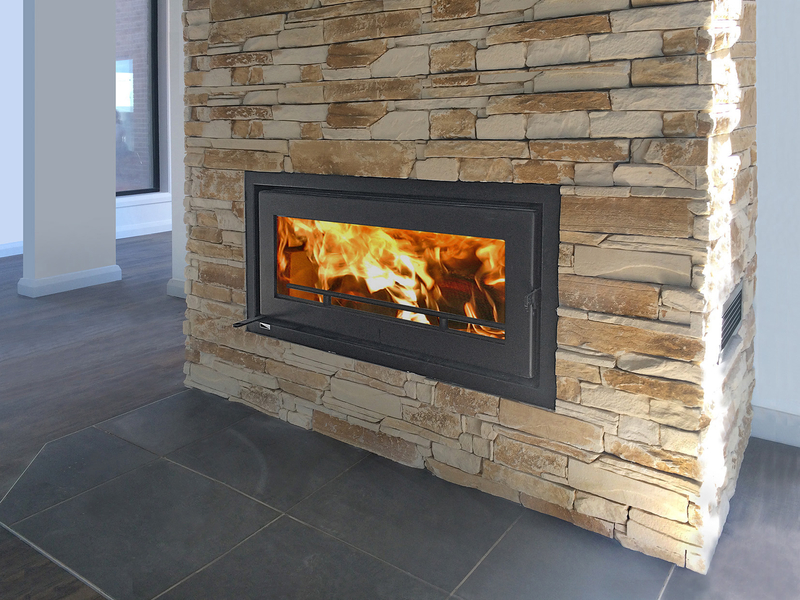 If you are looking for a hero piece in your home, a gas fireplace is a great option. With a wide range of trendsetting gas fireplaces on the market, it’s easy to find something to suit your home and style. Who doesn’t want a gorgeous fire at the push of a button! There is very little that can replicate the magic of a crackling camp fire apart from a gas fireplace. With the push of a button you can cosy up to the warmth and enjoy. The decorative benefits of our fireplaces is that they will transform the aesthetic appeal of a living space and provide a warm and cosy ambiance too. Whether you are looking for a modern design, or something more contemporary, it’s easy to find something to suit your style.